On March 27, 1877, the Staffordville Reservoir Company’s dam burst, flooding the valley for a distance of five miles and causing the loss of two lives. 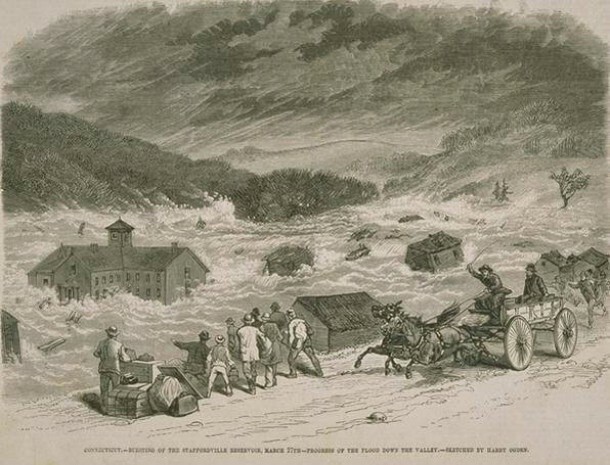 The dam, on the east branch of the Willimantic River, gave way at 6 a.m. and washed away bridges, smaller dams, houses, tenements, a church, livery stables and the manufacturing district from Staffordville to Stafford Springs, placing about one thousand people out of work. Most of the mills destroyed were cotton and woolen factories. The freight depot, a large number of freight cars, and two to three miles of the New London Northern railroad were also destroyed or swept away. At the time the reservoir was one and one quarter miles long and covered six-hundred acres. The dam had been recently raised several feet and at the time of the flood was full for the first time since the changes. The pressure of the additional water and the recent rains caused its failure.